Local efforts can impact the student loan epidemic and the future of the housing market. Becoming a homeowner has long been a coveted rite of passage for young adults, but in the days of higher education (and higher student loans to pay for it), this is not always an immediate possibility for most millennials. 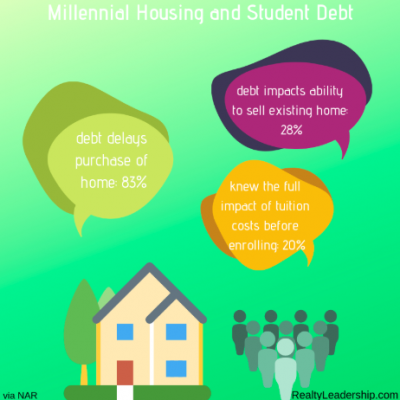 In fact, 80 percent of millennials do not own a home, and of that 80 percent, 83 percent maintain that their student loan debt is the number one factor holding them back from purchasing a home. This means that of the 75.4 million millennials in America, 66.4 percent, or 50 million members of that generation, do not own a home because they believe their student loans prevent them from doing so. Because of student loan debt, many graduates find themselves with more difficulty paying off other debts, making investments, and saving up their money as quickly as they would like. It can be a very discouraging atmosphere for someone who wants to own a home. One of the most striking statistics from this survey is the fact that only 20 percent of millennials knew the full costs of tuition, housing, and expenses before they enrolled in college. Is it a coincidence that only 20 percent of millennials are homeowners? It may not be the same 20 percent, but being informed of the cost of education definitely sets a person up for relatively greater success. As an agent, you can play the long game when it comes to future borrowers becoming buyers and sellers. The National Association of REALTORS®, for example, supported a September 2018 student loan counseling bill that would give prospective borrowers enhanced financial counseling and empower them to make better decisions regarding their investment in higher education. On a more local and personal level, however, individual agents can make an impact that could increase the likelihood of future generations’ abilities to purchase new homes. Outside mortgages themselves, student loans represent the greatest portion of the nation’s debt. The shift in this pattern begins at a local level. This effort can be as simple as speaking with clients who have adolescent children about their financial futures, and pointing them toward loan counseling resources and financial services that could be beneficial to them. To address this issue provides a personal touch to your interactions with clients; it also widens your referral network via the resources you provide. Another option is speaking at local high schools to juniors and seniors who are preparing to apply for college. This could be a well-researched presentation on student debt statistics, perhaps highlighting the relative costs of in-state universities, or it could simply be a public service announcement emphasizing the importance of educating oneself on the true extent of college tuition and expenses. Agents can also connect with high school guidance counselors and inform them of statistics they may have only been peripherally aware of, such as those provided by NAR. It is the job of these professionals to set their students up for success, and their success may impact the housing market in the following decade. By involving yourself in the student loan crisis and its effect on the homebuying of graduates, you not only form a deeper connection with your community, but also create an investment in the future of your business and the welfare of the next generation of homeowners.